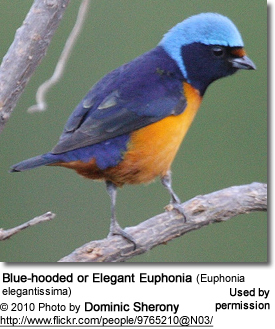 The Blue-hooded Euphonias (Euphonia elegantissima) are also known as Blue-rumped Euphonias, Blue-headed Euphonias, Blue-rumped Euphonias and Elegant Euphonias. 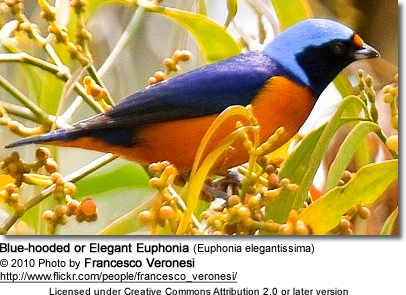 These songbirds are found in Belize, Costa Rica, El Salvador, Guatemala, Honduras, Mexico, Nicaragua and Panama. 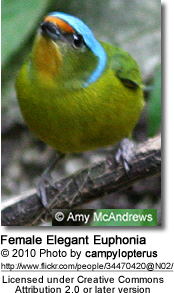 They inhabit subtropical or tropical moist montane forests and heavily degraded former forests. These finches are common within their natural range. Range: Northwestern Mexico; specifically the state of Sonora, where it occurs in southeastern parts, south to northeastern Sinaloa. Range: Western and central Mexico - from the state of Sinaloa (southern parts), Guanajuato and southern Tamaulipas), where it mostly occurs in mountains; ranging to Belize, central and southern Guatemala, Honduras, El Salvador and central-northern Nicaragua. Range: Southwestern Nicaragua, south through the mountains of Costa Rica and western Panama, east to the province of Veraguas). Their diet consists of a variety of tree-borne fruits. 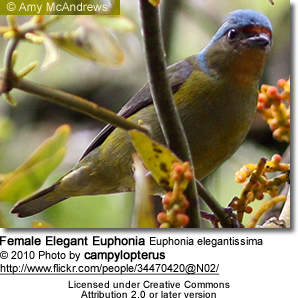 The Blue-hooded Euphonia feeds nearly exclusively on mistletoes, which make up about 80% of its diet. Their gut is specially adapted for mistletoe berries, which are poisonous.